Adrian Dale (born October 24, 1968) was a right-handed batsman and a right-arm A medium-pace bowler who scored over 12,500 first class runs and took over 200 first class wickets. 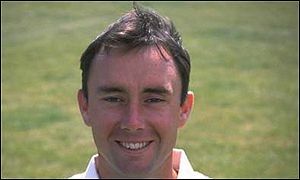 He played exclusively for Glamorgan, playing with the team between 1989 and 2004. His only other first class games were when he was selected to tour South Africa with England A in 1992. Adrian was born in South Africa but raised in Wales. Most recently, he participated in the Twenty20 Cup matches of 2003 and 2004, finishing his career by hitting the winning runs in the crucial game of Glamorgans 2004 1st Division One Day Championship. Hi Adrian, how is life in New Zealand? It’s pretty enjoyable. I have some good friends out here and the country is set up well for sport and an outdoor lifestyle which I enjoy. Are there any differences in attitude and ability between the New Zealand game and the British game? As a nation, they are more comfortable with ‘talking themselves down’ and playing as underdogs. They like to make sure the feet are firmly grounded! The British mentality of supporters and media is to build their sport stars up to a point where players become clearly over – rated and too much pressure is put upon them. Club sport is also taken far more seriously with cricket comprising of three training nights and a full weekend commitment. At Chepstow we sometimes never trained although I believe times have changed now! Are Cornwall CC having much success? They were the National Club Champions in 07/08 but not so good last year. In general they are looked upon as the premier club in NZ and have a long history of success which started when the Crowe brothers and Mark Greatbach came through their ranks. More recently this success was continued with Adam Parore, while they have also had a stack Auckland representative players. It’s also the largest club in Australasia with 1150 juniors and 19 senior teams. What made you decide to move to Auckland? It’s where my wife, Ruth, is from. I initially went to Auckland to be the overseas professional for Cornwall and have a lot of friends here. From your time at Glamorgan which matches do you look back on with the fondest of memories? Of the titles that we won, the most memorable for me was the 1993 win against Kent at Canterbury. I remember a beautiful day with huge amounts of spectators sat on the grass in front of packed stands. It was Viv Richards last game for Glamorgan and after the win the interaction with the supporters at the Bat and Ball pub in Canterbury was incredible. Outside of the title winning matches other fond memories are; Captaining Glamorgan to victory against a strong Surrey team at the Oval in a Championship game in 2001. Scoring my first 100 v Gloucestershire at Abergavenny It was relief as I had been dismissed on 99 the game before at Warckshire! Taking 10 wickets in a game v Sri Lanka at Cardiff. This was my best ever match bowling perfiormance but also coincided with me getting my only first class pair. There’s a long list. I never found the game ‘easy’ and so most challenges were tough. The quick bowlers like Courtney Walsh and Allan Donald used to hit you on the body or gloves before getting you out. The wrist spinners like Shane Warne and Ian Salisbury used to totally embarrass you before getting you out. Sometimes the embarrassment was worse than the pain! The Warwickshire team in the early 90’s was pretty special captained by Dermot Reeve. I think many people would agree that you are a Glamorgan legend, which fellow cricketer would you regard as being a legend? I’m not sure I deserve that title, but there are players that do. Matthew Maynard probably stands out. He was an inspiring cricketer and captain. While, at times the supporters (and team mates on occasion) became frustrated with him, he became better and better with time. Under different management he could have been an England great rather than simply an England player. Stephen James, Robert Croft and Steve Watkin were outstanding while Colin Metson stands out as being exceptional behind the sticks. Is there one wicket or winning run you remember as giving you the most satisfaction? Hitting the winning runs against Saj Mahmood, Lancashire at Colwyn Bay to win the 2004 First division title gave me a lot of satisfaction as it coincided with my last season at the club. In fact it was my penultimate game for the club and considering that I was whacked for six off my last ball in my final game I should have hung my boots up then!